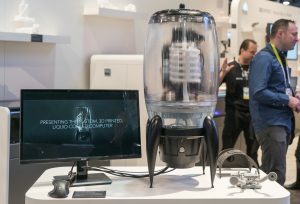 3D Systems unveiled a super cool product at this year’s CES – the 3D printed Liquid-Cooled Computer. 3D Systems’ team of engineers basically redesigned the good old computer we all love and cherish. They set off by collecting 3D data from the motherboard, graphics card, etc. – with the help of a Geomagic Capture 3D Scanner – and then converted that data into CAD models with the Geomagic Design X. Then, the models were transferred into Geomagic Design CAD software and Geomagic Freeform, in order to make an assembly of sculpted parts to house and cool the computer. “This turned out to be a great project for our team because it not only showcases individual technologies, it shows how they all work together to solve complex design and engineering problems,” said Cyle Caplinger, Business Development Manager, Software, 3D Systems. In order to make a transparent reservoir that would be compatible with the chemical properties of the coolant, the team of engineers had to print a master pattern from which they could later derive a silicone mould for casting in lexan-like urethane. “The combination of 3D printing processes and traditional manufacturing that we chose allowed us to match our design intentions with material performance,” said Sean Perkins, Global Benchmark Manager, On Demand Parts, 3D Systems. 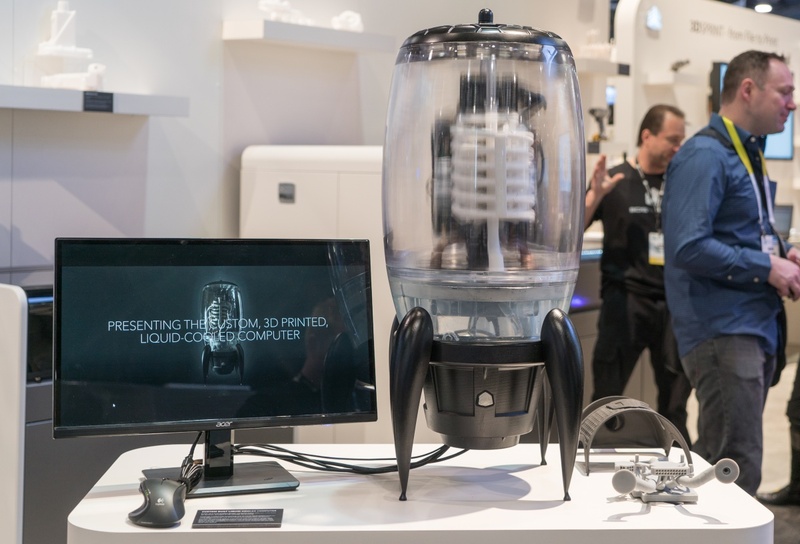 Click here to check out more cool stuff from CES and 3D Systems.